A platform for startups, businesses, and people to get feedback, ideas, analysis, or even get gigs done. People on the website compete for Bounties (cash incentives), and the best response or most qualified person for a particular service has a chance to earn the Bounty. This platform not only provides startups with feedback from the user base, it also helps promote the startup or business as well by engaging potential customers. BountyIt also makes project management easier and less risky via service provider ratings, a built-in agreement and milestone management system, autopay upon completion, and several other features. 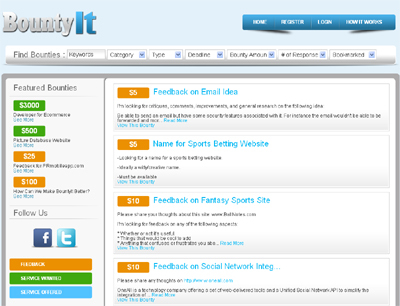 BountyIt not only provides a place to get great feedback but get services that will improve your business as well. It is a one-stop shop to improve aspects and complete tasks that will improve your business.